← I Done Broked my Lens! 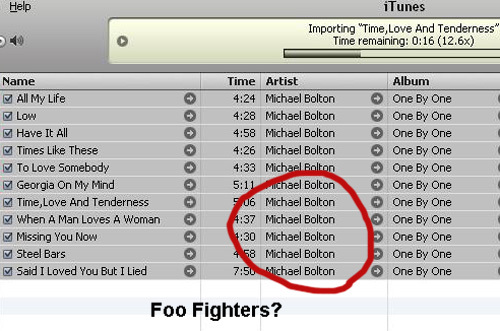 I plugged the Foo Fighters CD “One by One” into my CD Drive, iTunes pops up and look what I find! Apparently Michael Bolton is hacking the internet in order to increase his sales. Thankfully, after changing up the artist name in iTunes I have determined that I am the owner of ZERO Michael Bolton music.